Shannon Murphy, 17, is a senior at Presentation High School. She is the co-anchor of her school’s television station. Shannon is involved in clubs and at school and is a class representative. She is a member of the varsity tennis team. In the future, she said she wants to pursue journalism as an anchor. Forget baseball and football, one the best and most consistent teams at TCU is its all-women’s rifle team. TCU’s is one of the few dominant programs in the country. 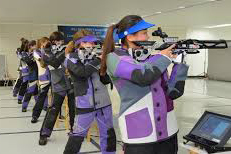 “Our rifle team is one of the best in the country,” said Brandie Davidson, a TCU athletic media relations assistant. The team went to its first NCAA Championship in 200. Since then it has made nine consecutive appearances.The Frogs were the first all-women’s team to win the championship team in 2010, which was also a year TCU hosted the NCAA Championship. 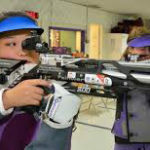 TCU is one of six teams in the NCAA’s Patriot Rifle Conference. The conference also includes University of Nevada, Ohio State, University of Texas-El Paso, University of Alaska-Fairbanks and the Air Force Academy. TCU won the 2016 Patriot Conference Championship in February and marked an undefeated season highlighted by a victory over UTEP.